Seriously why doesn't SoCal rain a lot more so this gal can justifiably buy cute rain boots without feeling slightly silly??? Savvy Sis found these by Agnes B or AIGLE and I found myself loving the color and design. 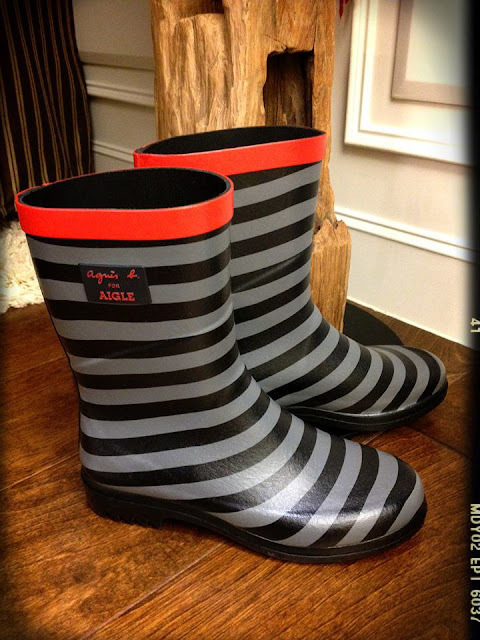 Sigh.....Isn't this pair of rain boots just fun? cute boots =) yeah its so hot here in socal, we need rain! Adorable rain boots really make a gloomy day brighter! p.s. If you get a chance, could you update the link on your page to my new blog address? Thanks dear! Adorable! Never seen boots so cute.